Immunisation is a cornerstone to primary health care and is an exceptionally good value. The 14 low-income and middle-income countries in the Middle East and North Africa region make up 88% of the region’s population and 92% of its births. Many of these countries have maintained high immunisation coverage even during periods of low or negative economic growth. However, coverage has sharply deteriorated in countries directly impacted by conflict and political unrest. Approximately 1.3 million children were not completely vaccinated in 2017, as measured by third dose of diphtheria–pertussis–tetanus vaccine. Most of the countries have been slow to adopt the newer, more expensive life-saving vaccines mainly because of financial constraints and the socioeconomic context. Apart from the three countries that have had long-standing assistance from Gavi, the Vaccine Alliance, most countries have not benefited appreciably from donor and partner activities in supporting their health sector and in achieving their national and subnational immunisation targets. Looking forward, development partners will have an important role in helping reconstruct health systems in conflict-affected countries. They can also help with generating evidence and strategic advocacy for high-priority and cost-effective services, including immunisation. Governments and ministries of health would ensure important benefits to their populations by investing further in their immunisation programmes. Where possible, the health system can create and expand fiscal space from efficiency gains in harmonising vaccine procurement mechanisms and service integration; broader revenue generation from economic growth; and reallocation of government budgets to health, and from within health, to immunization. The conflict-affected countries have had sharp declines in immunisation coverage, as measured by diphtheria–tetanus–pertussis third dose (DTP3) coverage. Many of the countries that have maintained high DTP3 coverage have been slow to adopt the newer, more expensive WHO-recommended vaccines because of financial constraints and the socioeconomic context. Governments and ministries of health would ensure important benefits to their populations from investing further in their immunisation programmes. External assistance for the countries in the region affected by conflicts, war and economic turmoil remains far from adequate in helping governments cover pressing basic social and health needs, such as immunisation. Looking forward, development partners should play an important role in helping reconstruct health systems, including immunisation, in conflict-affected countries. Many of the countries in the Middle East and North Africa (MENA) region have been directly and indirectly impacted by turmoil, with Iraq, Libya, the Syrian Arab Republic (henceforth, Syria) and Yemen in civil war and millions of refugees fleeing to neighbouring countries. Armed conflict, political unrest and terrorism have destabilised economic growth, trade and tourism. The 2014 oil price shock hit oil producers in the region, such as Algeria and the Islamic Republic of Iran (henceforth, Iran), hard. The MENA region has some of the world’s highest rates of youth unemployment.1 International sanctions have been imposed on some of the countries including, for example, Iran, the Sudan (henceforth, Sudan) and Syria. In this unstable context, we examine how immunisation—a cornerstone of primary healthcare—has fared. Immunisation is an exceptionally good investment in health, returning many more dollars in benefits for every dollar spent.2 Have governments managed to protect these services, even in times of constricting budgets? Have governments managed to improve the coverage and scope of these critical programmes? This paper assesses the performance of the 14 low-income and middle-income countries in the MENA region in achieving high and equal coverage among socioeconomic and geographical groups and in introducing new lifesaving vaccines in recent years (2010 to 2017). It focuses on what we can learn about the financing challenges faced by countries and how they might be addressed looking forward. The MENA region consists of 6 high-income, 12 middle-income and 2 low-income countries, according to the World Bank’s most recent income classification.3 For the purposes of this paper, State of Palestine (henceforth, Palestine) is included as one of the 12 middle-income countries (MICs). Countries are classified as low income if their 2017 gross national income per capita (GNI p.c.) is US$995 or less, as middle income if their GNI p.c. is between US$996 and US$12 055, and high income if their income is above US$12 056.3 This paper focuses on the 12 MICs, Algeria, Djibouti, Egypt, Iran, Iraq, Jordan, Lebanon, Libya, Morocco, Palestine, Sudan and Tunisia, and the two recently reclassified low-income countries, Yemen and Syria. Gavi, the Vaccine Alliance (henceforth, Gavi) is almost the sole source of external assistance for immunisation in the region. Most countries do not receive any external assistance for immunisation. Only three (Djibouti, Sudan and Yemen) have been eligible for support from Gavi though Syria has become fully eligible for Gavi assistance in 2019 given its recent income reclassification. How has immunization performance fared recently? Immunisation performance has multiple dimensions, including overall coverage, coverage distribution and the availability of vaccines in the national schedule. Overall coverage is typically measured by the percentage of children receiving their third dose of diphtheria–pertussis–tetanus containing vaccine (DPT3) according to WHO and UNICEF estimates. Coverage distribution refers to the reach to vulnerable subgroups categorised, for example, by income, race, ethnicity, disability, religion, migratory status and location. This is typically measured by household surveys or administrative data. The vaccines in the national schedule—compared with WHO’s recommended vaccines—is another performance dimension. Traditional vaccines, such as oral polio, have been manufactured for decades and can be purchased at low prices. The newer vaccines that are WHO- recommended, such as rotavirus, pneumococcal conjugate and human papillomavirus (HPV) vaccines, are more expensive and can be a challenge for countries to introduce. In 2017, the 14 countries accounted for about 10.7 million births of 141 million births globally and 1.29 million unvaccinated/undervaccinated children of 19.9 million globally.4 5 Nearly 95% of the unvaccinated/undervaccinated children were concentrated in six countries: Iraq, Yemen, Syria, Egypt, Algeria and Sudan. Many countries have strong and relatively consistent immunisation performance as measured by DTP3 coverage. These include Algeria, Egypt, Iran, Jordan, Libya, Morocco, Sudan, Palestine and Tunisia, all with at least 90% DTP3 coverage, across the period 2010 to 2017 (figure 1A).5 On the other hand, Iraq, Syria and Yemen, which have been impacted by prolonged conflicts and civil wars, have seen significant drops, with Syria showing the largest from 80% to 48% (figure 1B). Djibouti has struggled to bring its coverage above 90% and has seen a drop from 88% to 68%. DTP3 coverage, 2010–2017. Source: WHO (http://apps.who.int/immunization_monitoring/globalsummary/wucoveragecountrylist.html). For Palestine, data from UNICEF (https://data.unicef.org/topic/child-health/immunization/). DTP3 coverage across districts is used to demonstrate geographical disparities. It is country-reported to WHO and UNICEF annually on the ‘Joint Reporting Form (JRF)’.6 In 2017, Djibouti, Egypt, Iraq, Sudan, Syria and Yemen were well below the Global Vaccine Action Plan (GVAP) target7 of percentage of districts at or greater than 80% DTP3 coverage. Household surveys can highlight coverage challenges. In Yemen, the 2013 Demographic and Health Survey results found that DTP3 coverage was 54% in rural areas compared with 77% in urban.8 While in most countries urban areas have higher immunisation coverage than rural areas, residence in urban slums, particularly for recent migrants, puts children at greater risk of vaccine-preventable diseases due to low coverage.9 Urban slums are typically inhabited by households with low income and education levels and they may have insecure legal status. They are often poorly served by public services, and may be at increased risk of waterborne and vectorborne diseases. There are considerable differences in the uptake of WHO-recommended vaccines in the region. 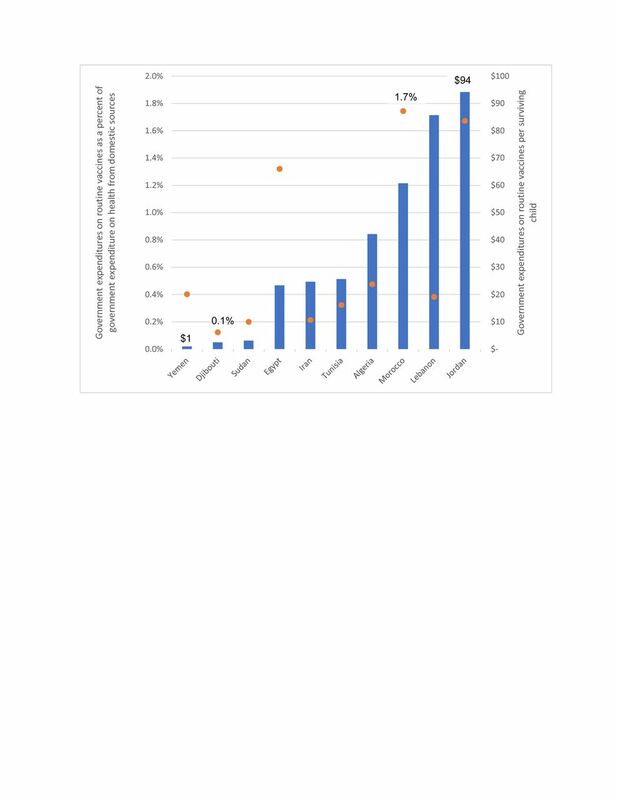 Many countries that have maintained high levels of DTP3 coverage have not managed to introduce many of the newer vaccines. Gavi has been providing funding for new vaccine introductions, operational costs of campaigns, cold chain and health system strengthening in Djibouti, Sudan and Yemen. With that support, these countries have introduced pentavalent, pneumococcal conjugate and rotavirus vaccines. Yemen and Sudan have also introduced measles–rubella (MR) and meningitis A vaccines, respectively,10 and there are plans for Sudan to introduce yellow fever, MR and possibly HPV vaccines in coming years. All three countries procure their vaccines through UNICEF Supply Division at favourable prices. While not formally Gavi-eligible over the period under review, the Gavi Board approved selected vaccines and cold chain support to Syria for up to US$25 million in 2017 and 2018, channelled primarily through UNICEF.11 However, given its recent income reclassification and Gavi’s eligibility guidelines, Syria has become eligible in 2019 for full Gavi assistance. 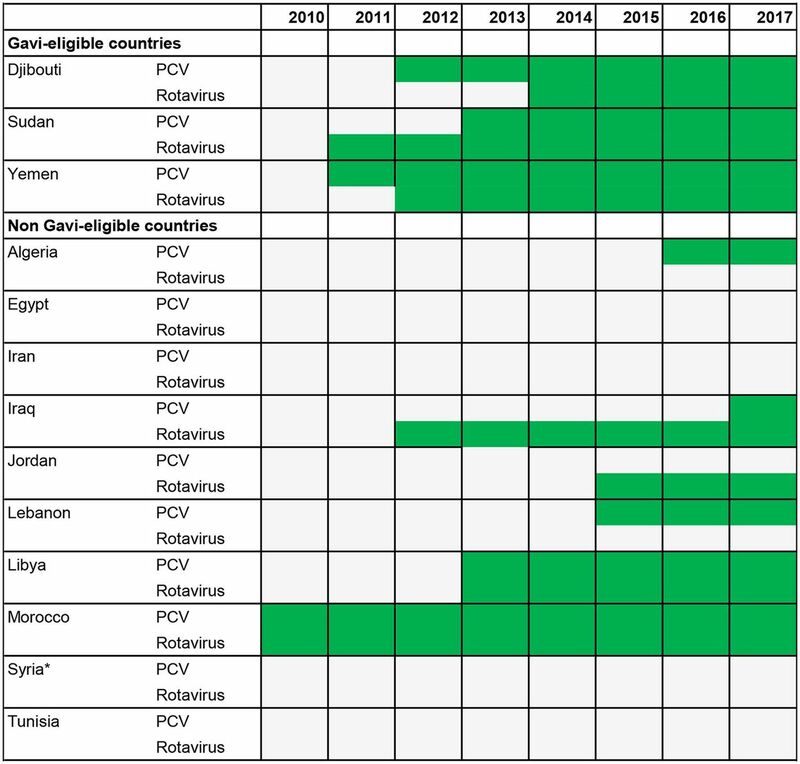 Figure 2 shows the introduction year of pneumococcal conjugate and rotavirus vaccines.12 Among the non–Gavi-eligible countries, Morocco is the earliest adopter of these vaccines, with both introductions in 2010. Libya has introduced both as well, but the remaining non–Gavi-eligible countries, including Egypt with the largest birth cohort in the region, have lagged behind on one or both vaccines. In most cases, the national immunisation technical advisory groups have prioritised these vaccines for introductions, but budgetary room has not been created to finance them. HPV vaccine has only been introduced in Libya to date. Year of introduction (in green) of pneumococcal conjugate (PCV) and rotavirus vaccines by Gavi eligibility. The Gavi Board approved some support for Syria on an exceptional basis, but it was not Gavi-eligible during the period. Source: WHO (http://www.who.int/immunization/monitoring_surveillance/data/en/). Data unavailable for Palestine. One out of six people in Lebanon was a refugee who was under the mandate of UNHCR. With that ratio, Lebanon continues to host the largest number of refugees as share of its population of any country in the world. When Palestinian refugees under the umbrella of the United Nations Relief and Works Agency are included, the number rises to one in four. One in 14 people in Jordan was a refugee under the mandate of UNHCR; this rises to one in three if Palestinian refugees are included.15 In a recent analysis, it is estimated that Jordan’s spending on refugees is nearly 2.25% of its gross domestic product (GDP) annually, or approximately 9% of its non-interest government expenditure.16 The estimates are probably conservative as they do not take into account hundreds of thousands of unregistered refugees and their budget impact. How are economic growth, government health expenditures and immunisation financing linked? Government expenditure on health from domestic sources per capita, 2010 and 2015. Source: health expenditure data from WHO Global Health Expenditure Database, accessed 1 Jun 2018 (http://apps.who.int/nha/database/Home/Index/en). Data available through 2015. Data unavailable for Palestine. Data unavailable for Libya and Syria in 2015. Economic growth was volatile and/or low or strongly negative in some years in some countries, including Iran, Iraq, Lebanon, Libya, Sudan, Tunisia and Yemen over the period.19 There is large variation in government expenditure on health from domestic sources p.c. (figure 3).20 Lebanon is the highest at US$285 in 2015, compared with only US$4 in Yemen. Lebanon’s highest spending is commensurate with its GNI p.c., which is the highest among MICs in the region, at US$7930 in 2015 according to World Bank data.21 Yemen’s already very low level of government expenditure on health p.c. from domestic sources has fallen by more than two-thirds since 2010, from US$15 to US$4 in 2015 (all figures in constant 2010 US$). Other countries with sharp declines include Syria, Libya, Iraq and Jordan. Djibouti, Egypt, Lebanon and Sudan have generally faced a flat trend. There have been exceptions. For example, expenditures have increased by 50% or more in Algeria and Iran, and by 20% in Tunisia in real terms. These indicators underscore both the diversity in public sector resource availability for health and the highly constrained budget situation in many governments in MENA. Percentage of routine vaccine expenditures reported as covered by government, 2010–2016. Source: WHO–UNICEF Joint Reporting Form. No data reported for Libya and Palestine, so they are omitted from the table. Some of the data are estimates from WHO (http://www.who.int/immunization/programmes_systems/financing/data_indicators/en/). Given Sudan’s income growth, it is expected to enter the accelerated transition phase from Gavi in 2020 and reach full domestic financing by 2025. Sudan will need to address the significant disparities in immunisation coverage and make budgetary room for financing traditional vaccines as external support for these vaccines may end as well. If not properly planned and handled, Sudan could face a disruption in vaccine procurement with consequences on vaccine stockouts, service delivery and coverage. Another way to examine government expenditures on vaccines is to look at these expenditures as a percentage of all government expenditures on health from domestic sources and per surviving infant. Figure 5 presents both these data for 2015. Of the countries in the figure, the highest spending on vaccines as a percentage of government expenditure on health is Morocco (1.7%) and the lowest is Djibouti (0.1%). Morocco has strongly prioritised immunisation within the health budget as evidenced by its early introduction of new vaccines. Morocco is fully financing its vaccines; Djibouti is still heavily reliant on external assistance. Vaccine expenditures per surviving infant range from only $1 in Yemen to about $94 in Jordan. Jordan has the highest vaccine expenditure per surviving infant, yet it has still not managed to introduce PCV (figure 2). Reported government expenditures on routine vaccines per surviving infant and as a percentage of government expenditures on health from domestic sources, 2015 (2015 US$). Sources: WHO–UNICEF Joint Reporting Form (JRF) for government expenditures on routine vaccines, 2015 (https://www.who.int/immunization/programmes_systems/financing/data_indicators/en/WHO); Global Health Expenditure Database (GHED) for government expenditures on health from domestic sources, 2015 (http://apps.who.int/nha/database/Select/Indicators/en); UN World Population Prospects for number of surviving infants, 2015. Libya, Palestine and Syria excluded because of lack of data from WHO GHED for 2015. Iraq excluded because data on routine vaccine expenditure in the JRF appear to have major errors. How are vaccines procured in the region and what impact does this have on costs and new introductions? Vaccines are a large share of immunisation programme costs and how they are procured can impact budget requirements. The three long-standing Gavi-eligible countries use UNICEF Supply Division procurement services. The non–Gavi-eligible countries carry out some or all of their procurement on the world market. Countries including Egypt, Iraq, Lebanon, Morocco and Palestine use the procurement services of UNICEF Supply Division for a number of their routine vaccines. Iran and Egypt locally produce a few traditional vaccines.25 Countries report data on vaccine prices to WHO and UNICEF on the JRF, and there is large variation in prices obtained for the same vaccines. Furthermore, there is some evidence that non-Gavi MICs in MENA are paying higher prices than non-Gavi MICs in other regions for several vaccines.26 Some of the important factors underlying price variation are country income level, choice of vaccine formulation and presentation, volumes purchased, contract duration, payment terms, country-required administrative procedures and supplier strategies. Countries may be able to review and modify their regulatory and procurement approaches to make quality vaccines more affordable, generating budgetary room for other needs including new vaccine introductions. Many of the low-income and middle-income countries in the MENA region have experienced a combination of low and volatile economic growth, ongoing conflict and political unrest--all factors that place pressure on government budgets and programmes, including health and immunisation.27 Conflicts have also impacted the neighbouring countries especially from the need to absorb and provide services to large numbers of displaced populations. Syria and Iraq, both in prolonged conflicts, have faced sharp declines in their DTP3 coverage since 2010. Yemen and Djibouti have also seen significant falls in coverage. But the majority of countries have impressively maintained high coverage over the period, meeting the GVAP target of DTP3 coverage of at least 90%. Countries doing well on coverage, however, have had challenges in introducing new vaccines that have been recommended by WHO, such as rotavirus and pneumococcal conjugate vaccines. They are in particular lagging behind the three long-standing Gavi-supported countries on introductions. Libya and Morocco are exceptions as both countries have introduced these vaccines. Libya has introduced HPV as well. This was aided by high-level political support and commitment. Morocco’s reported expenditure on vaccines show that it is allocating the largest share of the government health budget from domestic sources to vaccines, at 1.7% (figure 5). In the remaining countries, governments could create budgetary room for new vaccine introductions or for financing activities to improve coverage and reduce disparities either by reprioritising budgets away from lower priority activities to immunisation or by seeking cost savings in immunisation, for example, from modifying procurement mechanisms or synergising immunisation activities with other national health programmes. In terms of procurement, cost savings could be achieved in some countries through appropriate product presentation selection, more accurate vaccine forecasts, reductions in number of transactions per year, use of multiyear contracts and consideration to use existing procurement services (for some or all vaccines). At the same time, UNICEF Supply Division and partners can work with countries to explore the use of the Vaccine Independence Initiative or adapt commercial financing instruments to meet its prepayment requirement.28 It is estimated that the cost of targeted technical assistance to non–Gavi-eligible MICs ‘would come at a fraction of the cost of the investment made to subsidise vaccines in the poorest Gavi-eligible countries’.29 In this regard, Gavi is considering targeted assistance to these MICs as part of its strategy for 2021-2025. External support from donors and international agencies for immunisation has not been significant in the region except for Egypt and Morocco (mostly in the past) and Syria, Djibouti, Sudan and Yemen at the present, almost entirely from Gavi. External assistance for countries affected by conflicts and war remains far from adequate in helping governments cover pressing basic social and health needs.27 Funding for refugees and emergency humanitarian response has been a significant challenge in recent years in Jordan, Lebanon and Yemen. In conflict areas, in the coming years, medium- to long-term rebuilding of health systems (and immunisation programmes) will require significant resources and technical and external assistance. The authors are grateful to the individuals who reviewed this article and provided helpful input, particularly Daniel Ngemera of UNICEF MENA Regional Office. Senior government health officials and other experts and individuals from international organisations took time out of their busy schedules to be interviewed.
. MENA economic monitor. A new economy for the Middle East and North Africa, 2018.
, 2018. World population prospects 2017, medium variant. Available: https://esa.un.org/unpd/wpp/ [Accessed 4 Aug 2018]. , 2018. Available: http://apps.who.int/immunization_monitoring/globalsummary/timeseries/tswucoveragedtp3.html [Accessed Sep 10 2018]. , 2018. Available: http://www.who.int/immunization/monitoring_surveillance/data/en/ [Accessed 20 Sep 2018]. , 2018. Available: http://apps.who.int/gho/data/view.wrapper.HE-VIZ11a?lang=en&menu=hide [Accessed 13 May 2018].
. Immunization, urbanization, and slums: a review of evidence, UNICEF, 2016.
, 2018. Available: http://www.gavi.org/country/ [Accessed 20 Sep 2018].
. Immunization inequities in conflict affected countries, discussion paper. New York: UNICEF, 2017.
, 2018. Available: http://popstats.unhcr.org/en/persons_of_concern [Accessed 20 Sep 2018].
. The political economy of universal health coverage. Background paper for the global symposium on health systems research. World Health Organization, 2010.
, 2018. Available: https://www.imf.org/external/pubs/ft/weo/2018/01/weodata/index.aspx [Accessed 13 May 2018]. , 2018. Available: http://apps.who.int/nha/database [Accessed 6 June 2018]. , 2017. World development indicators. Available: http://databank.worldbank.org/data/reports.aspx?source=world-development-indicators [Accessed 1 Dec 2017]. , 2018. Available: http://www.who.int/immunization/programmes_systems/financing/data_indicators/en/ [Accessed 1 Feb 2018]. See Co-financing information fact sheet Yemen. Available: https://www.gavi.org/country/yemen/documents/ [Accessed 23 Jan 2019]. , May 2018. Immunization Financing in MENA Middle-Income Countries. Available: https://www.unicef.org/mena/reports/immunization-financing-mena-middle-income-countries [Accessed 23 January 2019]. , 2019. VP3: region fact sheet, working document November 2017. Available: https://www.who.int/immunization/programmes_systems/procurement/v3p/platform/module2/V3P_Region_Fact_Sheet_EMR.pdf?ua=1 [Accessed 22 Jan 2019]. , 2016. Staff discussion note. Available: https://www.imf.org/external/pubs/ft/sdn/2016/sdn1608.pdf [Accessed Sep 2016]. See the expansion of the vaccine independence Initiative (VII): protecting children with life-saving supplies. Available: https://www.unicef.org/supply/files/INNOVATION_LAB_LFLT_Ver1_Single_Pages.pdf [Accessed 5 Feb 2019]. Contributors This analysis stems in part from work that HS and MK did for NS-A and KS at UNICEF MENARO. This analysis paper takes the work further, with updates to the data and additional analysis. HS prepared the first draft of the paper and NS-A, MK and KS materially participated in revisions and redrafting. All participated in early brainstorming about the analysis. Funding This work was supported in part by Gavi, the Vaccine Alliance. Disclaimer The many individuals who contributed to the report may not endorse these views, and they bear no responsibility for any errors.